The problem is, the punishment he inflicts upon himself is also inflicted upon the team, the club and the supporters, which makes his behavior completely unacceptable. I defended him after he was sent off last time, as I understood his frustration and thought the additional ban was uncalled for. This time, however, with the team in pole position and struggling to keep it, he had absolutely no business insulting the linesman in a way that allowed the referee to give him a straight red. I don't know what he said but we'll find out tomorrow, and I doubt it was pretty considering players don't get straight reds for words all that often. However, let me grasp for one last straw in Zlatan's favor here: there's a strong posibility he was sent off for being who he is rather than for saying something untolerable. Whatever he said, I doubt it can be worse than the insults Serie A players hurl at officials week in, week out, and if somebody like Chiellini or perhaps Gattuso said it, the linesman would have never alerted the referee. Some players with a bad rep like, say, van Bommel know when to keep their mouths shut. Some don't. Ibrahimovic doesn't, we knew that before he joined Milan, it's part of the package. Hopefully, with Pato's form, Cassano's return, Pirlo's return, a 3 point lead, and the fact Milan simply play the most effective football in Italy right now, Zlatan's dismissals won't affect our scudetto aspirations. 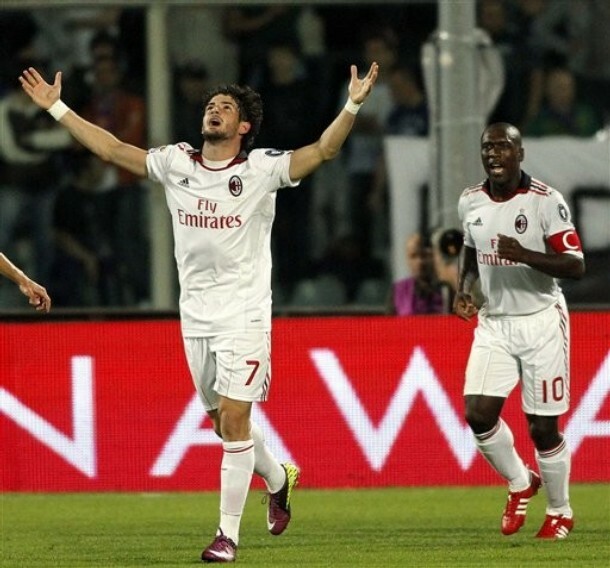 As for the rest of the team, Pato and Seedorf were as stellar as they were last Saturday. 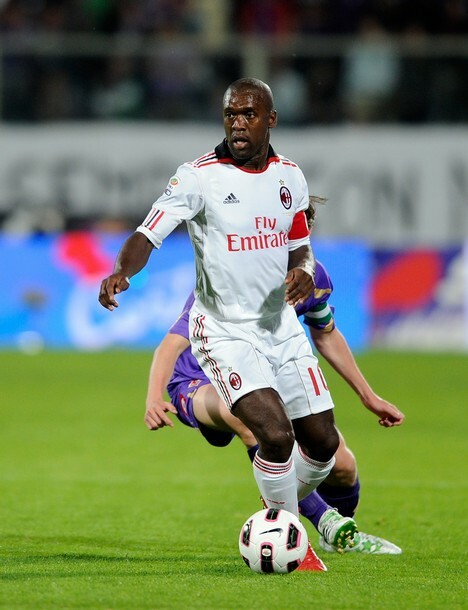 Seedorf ruled the midfield, controlling the tempo of the game, launching a few one on ones and scoring the crucial opening goal that sent Milan on their way to 3 points. He managed to put in a decent defensive shift as well, Comotto's attempt at provoking a penalty by holding onto his arm and dragging him down with him was very well performed and had at been van Bommel instead of Clarence, that penalty would have been given in a heartbeat. Some player's reputation works against the team, some for the team. Seedorf is always one of the good guys in that respect. Pato was very involved through-out the game and seems to be developing a better understanding with Ibrahimovic. Maybe if Zlatan would play more than one game in a row now that Pato is in top form, their partnership could grow further. They both fell back and drifted out wide on occasion, but unlike some previous matches, the movement looked somewhat coordinated and is definitely something to build on for next season. It goes without saying that I in no way support the idea of not buying Ibrahimovic in the summer (if such a clause even exists), the man was monumental in putting Milan on top in the first half of the season. His decline in form and mental stability is a lesson for next year, and it reads: rest him when we can do without him or he'll be drained out by March. Milan's defense was admirable tonight and, until Babacar's introduction at halftime, had no problems handling their opponents. The physicality and pace of the Senegal youngster created some space for Fiorentina's midfield, and we immediately saw an increase in shots from distance, mostly by Vargas and Montolivo. 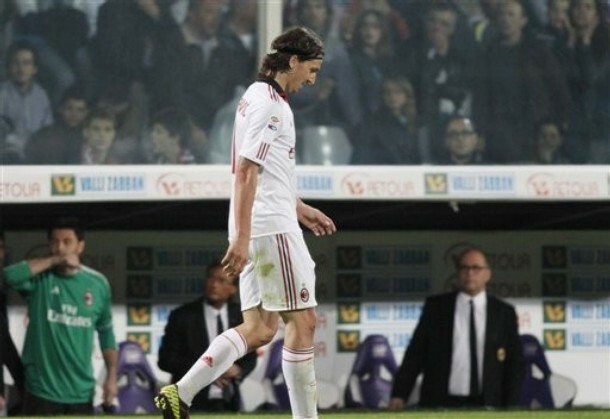 The former was far more precise, even though his goal can be attributed to an unlucky deflection off Gattuso's chest. Abate made Vargas invisible on the hosts' left wing, forcing him to cut inside to try and make an impact with his weaker right foot. With that said, his weaker foot is still stronger than most people's wtrong foot and he could have been closed down a bit more carefully. Yepes and Zambrotta used their vast experience to stop the faster Fiorentina players from breaking into the box, while Thiago Silva was his usual dominant self. Mihajlovic's tactics, especially in the first half, were no better than Leonardo's. He started with a suicidally high defensive line, leaving 30 yards of space for Pato, Ibrahimovic and Boateng to storm into. This is the kind of game Pirlo would have utterly owned, but Seedorf did an admirable job we can't complain of. Had Ibra been more precise the first time he was one on one with Boruc, this review would look very different, seeing how he would have never have been sent off and the game would have been won after 60 minutes. Due to the numerous times Fiorentina players asked for penalties and various free kicks during teh game, expect Inter's share of the media to have a field day tomorrow and compare Ibra's verbal insult to Chivu punching a defender from behind while wearing a helmet. Gilardino should have been booked for his ridiculous 'I've been shot 28 times by a WWI machine gun' dive and Comotto's attempt, while admirably crafty, was seen through by the excellent Morganti. All in all another good week for Milan, save a certain Swede who needs another 2 weeks off to get his head straight. Napoli are 3 points away and another 6 weeks of tremendous importance awaits us, so stay tuned and Forza Milan!